Many Digital Marketers can agree that pulling and reviewing reporting data from a digital analytics program and seeing it live online is fun, super fun! One of the most important tasks for a Digital Marketer is providing client reports that include this digital analytics data. I’ve used a few digital analytics programs in my career; Omniture, MOZ, Google Search Console, AdWords and Google Analytics. Social Media channels are also integrating their own analytics tools as well. Google Analytics can pull in results from most all of your digital marketing channels, and make sense of those results in their Google Analytics tools. But for those of us who have been pulling those reports for years, you understand the feeling of, “oh puke”, what’s this? When we get a garbled PDF, or an excel spreadsheet only a genius is fit to untangle for the client to understand. We find ourselves spending countless hours creating pretty excel reports, and KPI metrics, dreaming of an excel guru. So began my search for just that guru, or program, that could solve these reporting headaches. The mission was to find a program that could pull in reporting data from many marketing program sources, including Google Analytics, and help create an easy to read, nice looking report for clients. The goal was to spend less time formatting a report and more time reading and interpreting the data. The fun part, remember!? 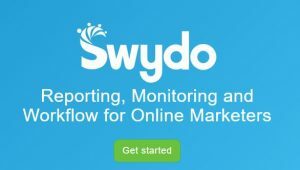 Along came Swydo, a digital analytics and reporting tool that is Easy, Fun, Fast, Simple, Secure, Low Cost, with Great Support! Need I say more?! I tested a few programs, created a few reports and ran into some complications. While twirling my thumbs waiting on chat heads to reply, I would return to Swydo, have more fun, and create more reports with ease. Before I knew it, all my clients were set up, with reports, a grip on the tool and it was fun. About that time is when the chat heads reply from the other reporting tool appeared. With Swydo, there were very little confusing moments. If there were, the chat help was there immediately to explain a simple solution. Another feature of Swydo, is a project management tool. This is either the number 1 or 2 next tool we all need to keep things organized! You can organize projects and tasks under clients and invite others to work with you on those clients and projects. Integration with Google Drive and many Calendar programs is also possible. You can even log time spent on projects! One thing I found similar across the board with all the web analytics and reporting tools was most are only capable of pulling in data from a few marketing sources. For example, Google My Business has yet to integrated an API that would allow for Swydo or other programs to pull in their Analytics data. So, if you go searching for a reporting tool that can pull in more programs, best of luck. I think most of them (at a reasonable cost) are all waiting for the programs to release their data and make integration easy. In the meantime, the capabilities to filter a report that you pull from Google Analytics, into a Swydo report, allows for data you might need. I no longer dread reporting week! Swydo has made reporting week easy, fun and relaxing! That sounds impossible, but trust me, it’s awesome! If you are concerned with the minimal cost, think of it this way… how many hours do you spend on reporting that could be spent interpreting the data and creating actionable solutions and programs for clients and getting that project work done? It’s really that simple.